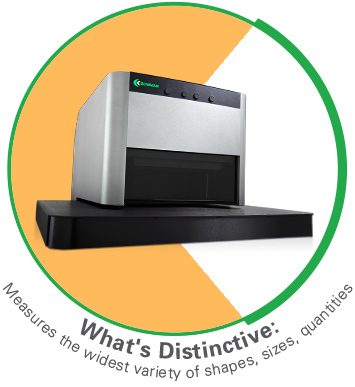 The P series offers the flexibility of measuring a wide variety of sample sizes, shapes, and quantities. It is equipped with a high precision programmable X-Y stage that offers several convenience factors over a fixed stage. Operators can use the mouse and software interface to move to desired measurement locations easily. Multi-point programs can be created to automatically measure multiple sample locations with the click of a button. Pinpoint control is achievable for testing critical areas on parts. Larger sampling volumes are possible through the multi-point programming for high throughput requirements. The standard configuration includes a 4-position multiple collimator assembly, and a variable focus camera allowing for measurement in recessed areas. Collimators and focal distances can be customized for particular application requirements. The solid-state PIN detector is included along with our long-life micro-focus x-ray tube. The high performance SDD detector is an optional upgrade.